The TopTENS Pain Relief System is a doctor recommended, over-the-counter (OTC) device that provides prescription-strength pain relief associated with sore and aching muscles in the upper and lower extremities due to strain from exercise or normal household and work activities. This easy-to-use device comes equipped with eight preset programs allowing you to customize your therapy and target your pain. Comes complete with three AAA batteries, lead wires and four reusable electrodes for effective therapy on the go. A great retail item as it is FDA cleared for over- the-counter sale. TENS Technology stimulates body’s own natural pain killers. Device has eight pre-set programs allowing you to customize your therapy and target your pain. TENS/EMS Units & Stimulators can be found in our extensive online collection of products from globally recognized and trusted brands, including Current Solutions. 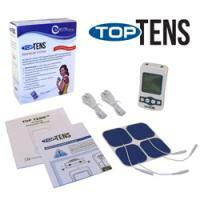 An excellent option to consider is the TopTENS Pain Relief System.